Underhill International released its new Gulp Ultramax Plus, a suction pump that can be disassembled. According to Underhill, the hand pump is used for quick cleanups of water-soaked areas on turf and landscape, including valve boxes and sprinklers. 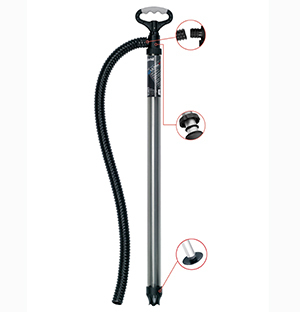 The pump is available as three sizes: 36-inch length with a 72-inch hose; 21-inch length with a 18-inch hose and as a 12-ounce syringe. UltraMax Plus is constructed with a clear polycarbonate cylinder body and aluminum grade pump shaft. The UltraMax Plus o-ring and wiper seal, head assembly and intake foot/filter are all removable for maintenance. An ergonomically-designed handle allows comfortable operation and a smooth, self-priming action draws in an extra high volume of water, the company said.